During the consultation phase, I asked Mark Weiner of HS2 Ltd if I could do some sensitivity analysis using their model. The request was refused. In previous posts, I have outlined some of the bizarre, irrational and dishonest assumptions used in the computation of the HS2 Economic Case. On April 11, the Guardian reported that the official forecast of HS2 benefits had been further downgraded. The latest figures issued by the HS2 high-speed rail scheme have revised down the economic benefits for the fourth time – suggesting the scheme will barely, if ever, break even. Originally the scheme was forecast to bring £2.40 of benefit for every pound invested. The revised benefit-cost ratio (BCR) is 1.2 : 1. A government paper in March 2010 projected the economic benefits at 2.4 : 1 for the London – Birmingham route [‘LWM’]. This was adjusted downwards by February 2011 at the beginning of the consultation, and again this January when transport secretary Justine Greening gave the green light to HS2, which is planned to be operational in 2026 and completed by 2033. The full route [‘Y network’], going north to Leeds and Manchester, now has an estimated BCR of between 1.5 : 1 and 1.9 : 1. Centro’s Midland Metro consultants, the Centre for Economic and Business Research, estimated the true benefit cost ratio of HS2 at around 0.5, which is similar to the number used by AGAHST. Birmingham city centre is a difficult place to navigate at the best of times, but as of April 2012, there is more disruption than (what passes for) normal, caused by extension works for the Midland Metro tramway, and ‘relooking’ of New Street station (Birmingham Gateway). Centro and the city council have stated that they intend to improve wayfinding in the centre, with better signage and information. But judging by Centro’s cack-handed fold-out leaflet, ‘Walking between Birmingham City Centre stations’, they have a long way to go. The leaflets appear to have only achieved distribution in early 2012, but it’s not clear how old they are, as there is no clear publication date on display. On one side of the leaflet, there is a general map of the city centre, covering streets as far north as St Paul’s Square. However, the ‘second entrance’ to Snow Hill station — to the north of Great Charles Street — is not featured, although it has been open for a year. On the other side of the leaflet, there is a map with recommended routes between the three main railway stations (New Street, Moor Street, and Snow Hill). As can be seen, the map is a lot smaller than it could have been, as a lot of space is wasted. Furthermore, details on the map are confusing, and it mislocates or misrepresents features such as the St Martin’s Queensway tunnel, and St Philip’s cathedral. On the map, the recommended route between Moor Street and Snow Hill involves the Great Western Arcade — which is usually closed outside shop hours — but that is not explained. By walking across St Philip’s churchyard, many pedestrians could equal a future ‘six-minute’ Midland Metro tram journey between Snow Hill and Stephenson Street, but the map does not show the path. The main entrance to Moor Street station — on the corner of Moor Street Queensway and Moor Street — is also not shown. The map does not show the council’s tourist information office in New Street, nor the Centro travel enquiry office in New Street station. But it does indicate the location of ‘information points’, without explaining what they are (namely: electronic display panels, or boards displaying printed timetables and suchlike). 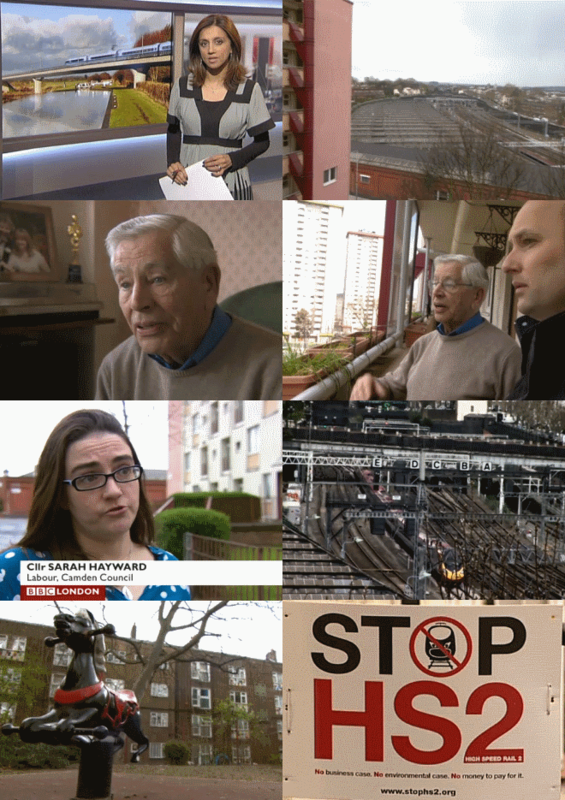 On 3 April, BBC London television news looked at the impact of HS2 in London. Their report included an interview with a resident of the Camden flats slated for demolition to make room for expansion of Euston station. Not surprisingly, residents are perplexed as to why their neighbourhood should be razed to allow people to get to Birmingham twenty minutes quicker. There may be complaints about crowding and fares, but most travellers would probably be satisfied with the existing journey time (of under an hour and a half), providing the reliability was there. Crowding and fares could be fixed for considerably less than the £20 billion cost of the new build track. So HS2 might be described as “production led” rather than “market led” infrastructure. Also featured was Camden councillor Sarah Hayward, who mentioned the blight effects caused by uncertainty. As in Birmingham, the zone potentially affected by HS2 in Camden is considerably larger than the land required for the line itself. Birmingham’s Island House, arguably the first property demolished because of HS2, did not stand within the revealed footprint of the proposed Curzon Street station. Trains account for over 20% of the cost of the Y network, so it’s unclear why Ms Greening omitted to give a figure that includes them. In the January 2012 ‘Updated appraisal of transport user benefits and wider economic benefits‘ rolling stock is listed separately at just over £8 billion. But they are just as much a network cost as land, stations, signalling, and suchlike. Like future patronage and fare levels, the lifespan of HS2 rolling stock is unknowable — but the planned intensive utilisation suggests that replacement would be needed more than once, over the 60-year appraisal period. The HS2 cost calculation does not seem to consider the cost of rolling stock replacement post-opening. Because there is no breakdown of Y network construction and procurement expenditure by year, corroboration of present values is not possible. For stage one (London – West Midlands), rolling stock expenditure would probably need to be in step with civil engineering expenditure (raising the present value of costs).